Constructed with a large rigid solid wood frame incorporating two slatted wooden shelves with twin-wall polycarbonate glazing hinged doors with latch fastening and a handy hinged lid with locking stays for ventilation. Great for plant protection and improved growth. 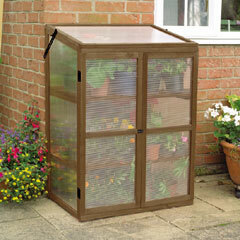 This wooden growhouse is a fabulous way to look after your plants during the colder months of the year. Over dimensions: 76 x 57 x 110cm high. The height at the front is 100cm.